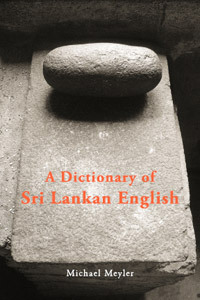 A Dictionary of Sri Lankan English was launched at the British Council in Colombo on 27 November 2007. See below for details of how to purchase a copy. ... a very useful addition to our knowledge of English world-wide and a fine contribution to the literature of Sri Lanka. A-Z of Sri Lankan English on the Groundviews website, together with other articles on the subject of Sri Lankan English. Sample pages: a pdf file containing selected extracts from the dictionary. Foreword to the dictionary by Prof. Ryhana Raheem, Post Graduate Institute of English, Open University of Sri Lanka. Speech given at the launch by Dr Dushyanthi Mendis, Senior Lecturer in English, University of Colombo. Updates and corrections: updates to the dictionary, corrections and new entries. This page is regularly updated. Please contact me if you have any suggestions or feedback which can be included. An A-Z of Sri Lankan English: a collection of short articles which appeared in the travelsrilanka magazine and the SLELTA Quarterly. A new A-Z of Sri Lankan English is now featured on the Groundviews website, together with other articles on the subject of Sri Lankan English. - in Sri Lanka (price Rs 1500): at Barefoot (Colombo and Galle Fort). Or contact me to order a copy direct. - online (price Rs 1500 plus postage and packing): from www.pererahussein.com.